Bella Playa Hotel has 214 rooms over 4 floors with 3 lifts. There's a 24 hour reception area, children's playground and bar. Guest rooms have satellite/cable TV, bathroom with shower, hair dryer, mini bar/fridge and balcony or terrace. Safe's can be hired. Leisure facilities include swimming pool, sauna and jacuzzi and gym. 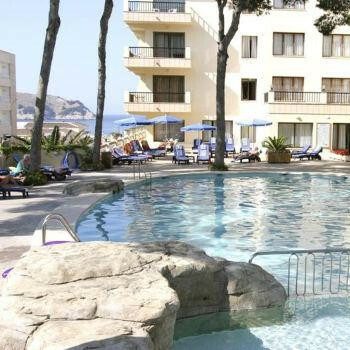 Cala Guya Beach is 200 metres away, the resort centre and Cala Ratjada marina approx 1k away. Just returned from a walking holiday that was based at the Bella Playa. Stayed in a single room which was of a good size, well equipped and maintained to a high standard. The sheets were changed during the week that I was there and towels were replaced daily. There are lots of pleasant seating areas scattered throughout the hotel and all public spaces were kept very clean as were the swimmimg pools, both inside and out, the gym and the sauna. Food is provided in the buffet style common in Spanish hotels and the standard is extremely high. The variety is exceptional and the quality of the food was marvellous. Tables are allocated on arrival and my only complaint is that the dining room is a bit cramped. Location is fine - on the edge of the resort of Cala Rajada with a walk of about 15 minutes to the harbour and about 200 yards to the beach on Cala Agulla which is lovely and sandy. Resort itself has a good selaction of cafea, bars, restuarants and shops. Staff friendly and efficient. Evening entertainment was unremarkable but daytime walking programme was very good and all guests can join in any of the walks. A great holiday and I would certainly return.